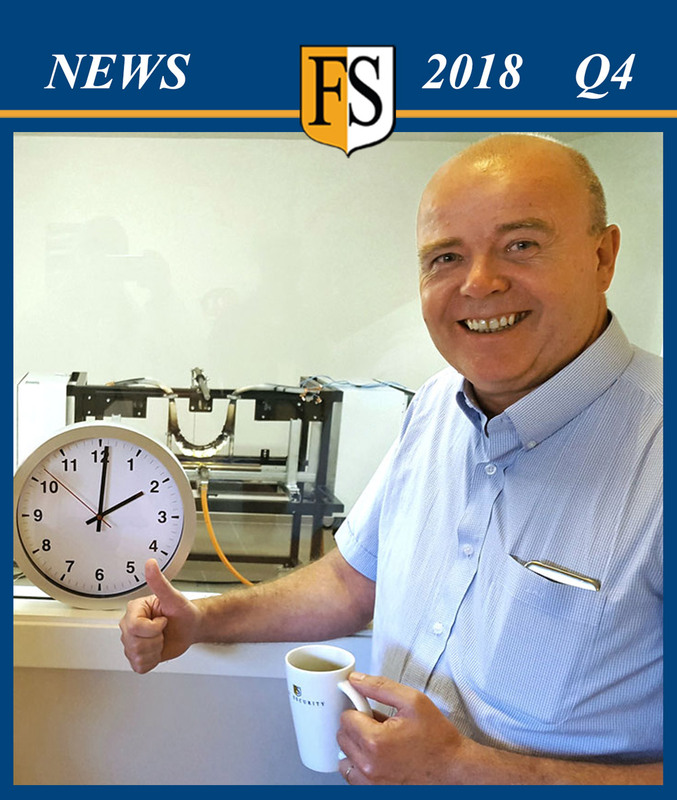 FS Worldwide Highlights from January to March 2018. In this quarter we present cable protection projects, cable surveys and business activities in many countries. For updated information and news, please visit our Facebook page that reached 6000 followers in March. We introduce IBAS Group as our representative in Southern and Central Africa. IBAS key operational management and staff are now formally fully qualified by Fire Security to evaluate and apply the FS range of cable protection solutions against fire, UV and other environmental damages. Meeting with MOL in Japan regarding fire protection on their LNG sea carriers. January 15 – Paal Mathisen in JAPAN: I have been to Tokyo for meeting with MOL to present our latest project for their fleet of LNG sea carriers. I also travelled to Shimizu and got this fantastic view of Mount Fuji. Cable fire protection project for Bahrain Steel. 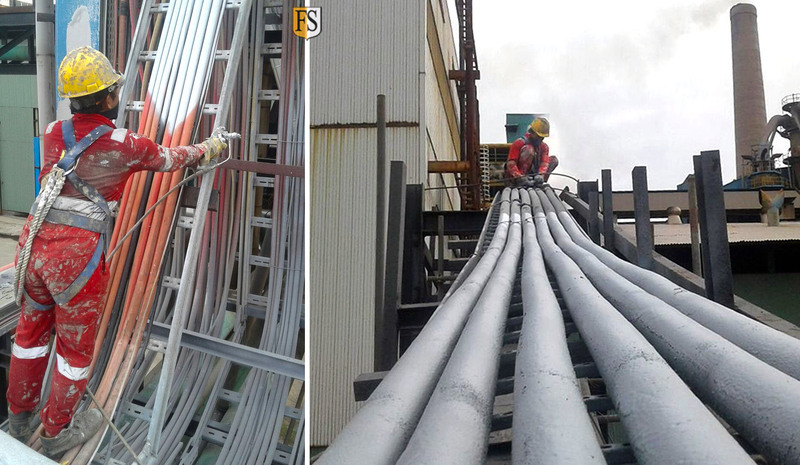 March 28 – Cable fire protection project for Bahrain Steel completed successfully, thanks to professional project management, client servicing, and Quality Assurance/Quality Control across the duration of the project. 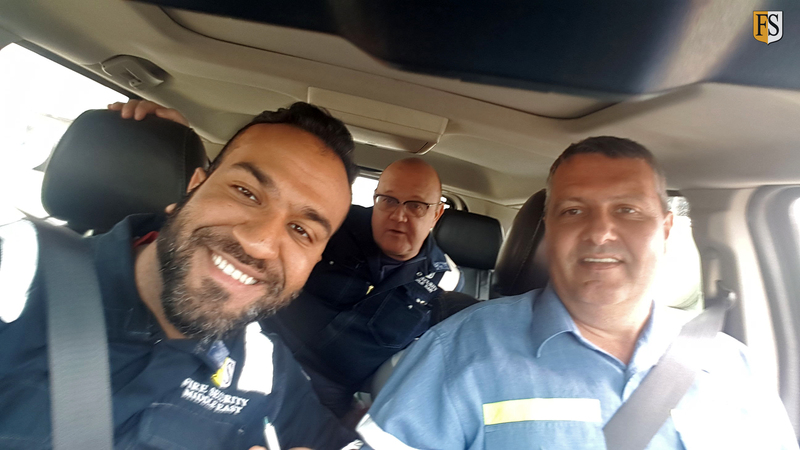 From left: Mohamed Alawi – FS Business Development Manager, Julian Mintowt – FS Operations Manager, Dave Orrell – Operations Manager at Shutdown Maintenance Services (SMS). Fire protection on board MOL LNG tanker. March 21 – Fire Security Middle East. Successful fire protection of 6.6 kV High Voltage cables on board MOL LNG tanker MV Kumul. 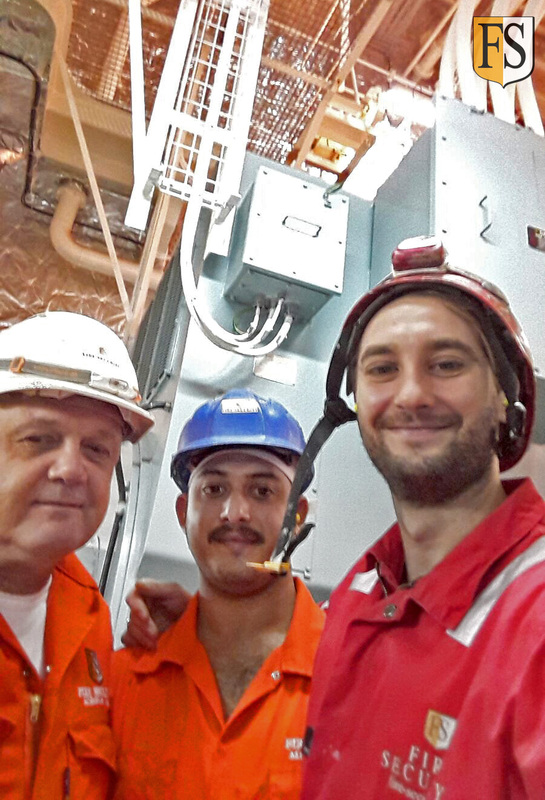 From left: Julian Mintowt, Muhammad Suleman and Piotr Kanczkowski in the Port Side Diesel Generator Room. Visiting oil and gas companies in Borneo. February 2 – Busy schedule for our Asia Manager: Been to BORNEO this week, home to the amazing Orangutan. Meeting with MLNG and Petronas Carigali gas division in Bintulu then move to Miri for Petronas Carigali oil division. Meeting offshore operators in Malaysia and Brunei. March 7 – Busy week in Brunei and Malaysia this week since the President of Fire Security have been visiting. Here with Tze Nian Lim from our Brunei agent PTT Engineering. Australasian oil & gas conference in Perth. 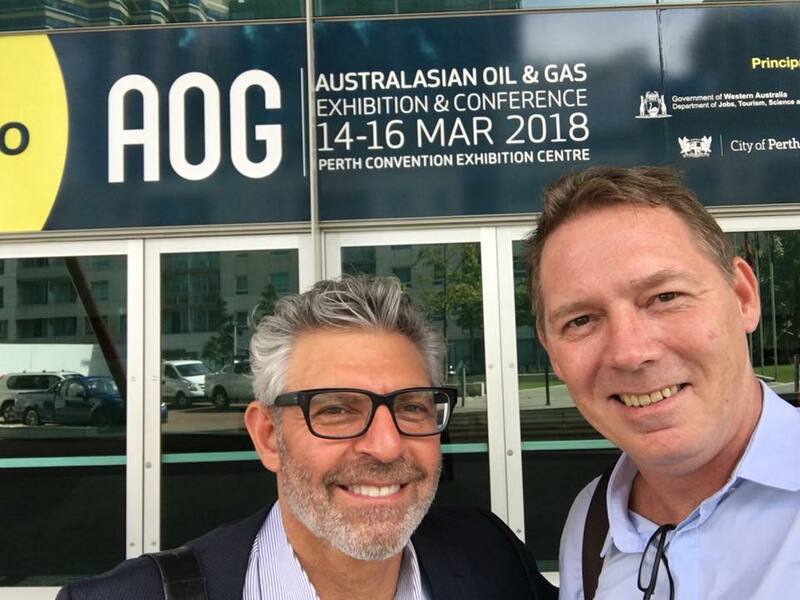 March 14 – Mark Hanna and Paal Mathisen are in Perth this week for the AOG and meetings with oil and gas operators in Western Australia. North Sea – High voltage cable repairs. March 9 – HIGH VOLTAGE cable repairs WITHOUT SHUTDOWN. 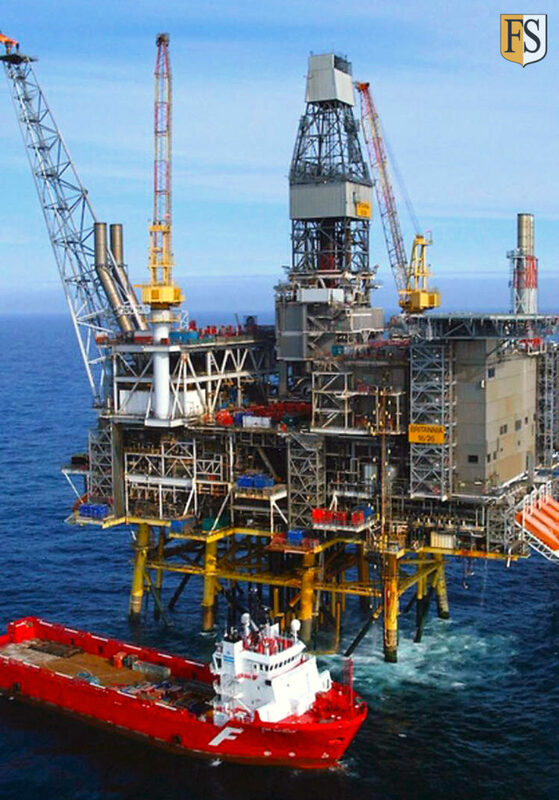 John Olaf Ryen and Jim Søllesvik successfully completed cable repairs on board the Britannia oil rig for ConocoPhillips in the North Sea.There was a huge concern that a shutdown was needed. This would cost millions of euros and loss of production. Due to the experience and knowledge from FS personnel Jim and John there was no shutdown necessary and production could go along as normal, while they performed the important High Voltage cable repairs. Protecting industrial cables in South Korea. March 19 – Electrical cables are the nerve system of an industrial plant, especially so at a power plant, like this one in South Korea. These cables are just one example from the job our Project Supervisor Steven Chong finished recently. Site survey at cement factory in the Philippines. 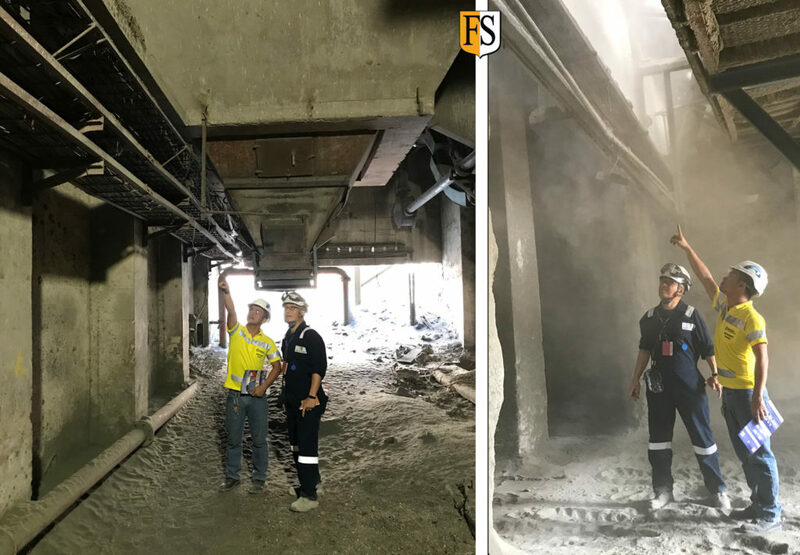 March 27 – Site survey at cement factory in Manila. FS’s Steven Chong identified several fire hazards area at the plant. Typically cement plants have a large number of heavy duty electrical equipment used for distribution, control, and electric power utilization, so it is important to protect the electrical cables against fire. 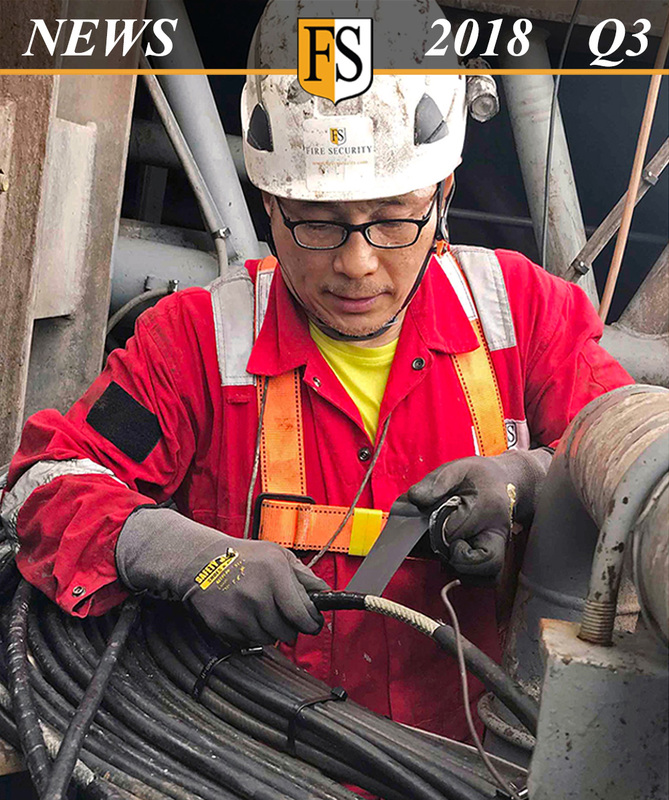 Cable inspection in Vietnam for Japan Drilling Co.
March 28 – Paal Mathisen in VIETNAM. Today I have been offshore for JDC -Japan Drilling Company. We were asked to do a full inspection of cable condition on the rig Hakuryu-5 on anchorage in Vung Tau. Ready to board the crew boat with JDC H-5 General Manager Okada san. Our representative IBAS Group in South Africa. 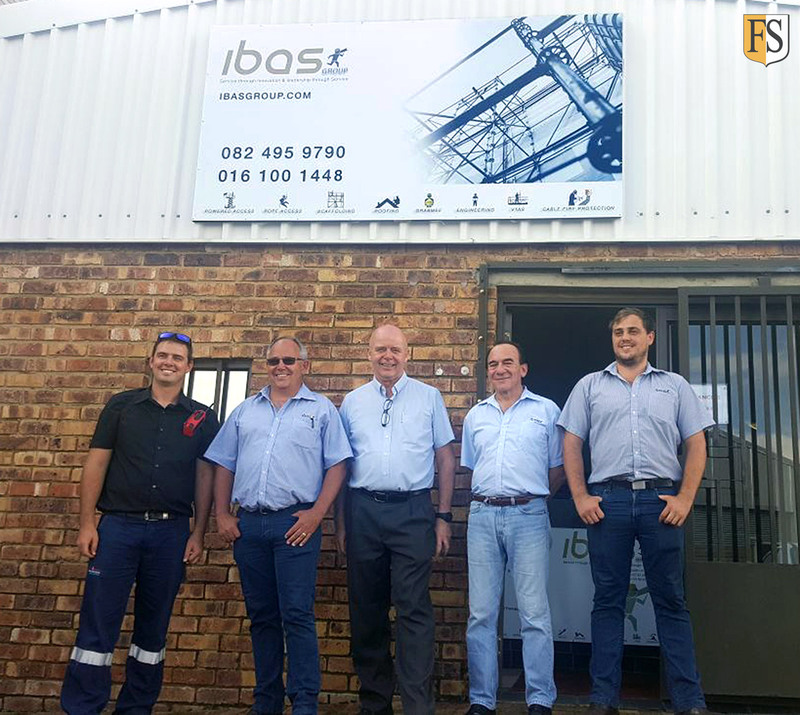 February 25 – SOUTH AFRICA: Exciting week started with a visit to our representative IBAS GROUP in Sasolburg. From left: Toby Oosthuizen, Wouter Booysen, Leif Harald Tveitnes (FS President), Errol Finkelstein, Wouter Jr.
IBAS Group has steadily grown into its role of local Southern and Central African partner for Fire Security of Norway since commencing in January 2017. Executives from both companies regular travel to each others’ offices and sites – almost poles apart, North and South! IBAS are one of the first FS partners world-wide to protect fibre-optic cable in an unusual project with newly laid cable, currently in progress. There are already 10,000s of metres of FS protected cable in South Africa, proudly supported by long term warranties. 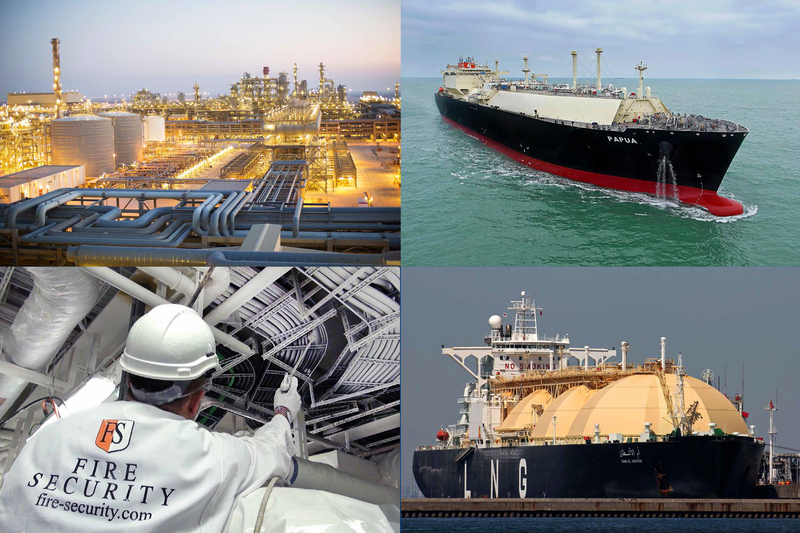 Enquiries and work come from the sectors as diverse as oil, solar power, mining, cement and marine. Large cable fire protection project in Sumatra. January 18 – Our Indonesia team has recently finished cable fire protection at a large factory. We sprayed 3000 meters of cables. FS inspect cables onboard Chikyu Scientific Drillship operated by Mantle Quest in Japan. 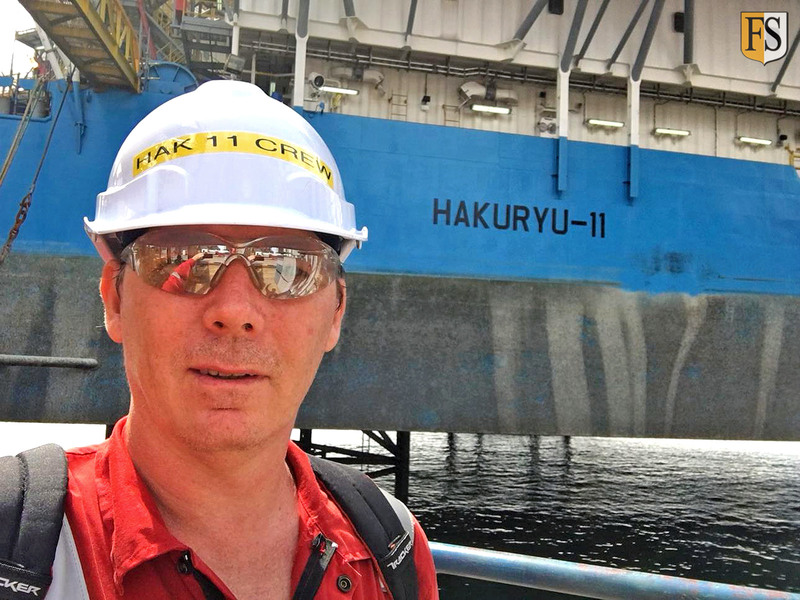 January 31 – Paal Mathisen reporting from JAPAN: I was recently invited by Mantle Quest Japan, the operator of Chikyu Scientific Drillship to inspect the condition of all cables onboard. This ship is used mainly for studies related to earthquake and plays a very important role in Japans struggle to understand more about their earthquake sensitive location, in order to prevent future tsunami and nuclear power plant disasters. We did the survey together with our local partner KBK, Kyokuto Boeki Kaisha Tbk (Photo: Kenji Shimada – left, and Paal Mathisen). Working towards the Australian oil-and-gas market. 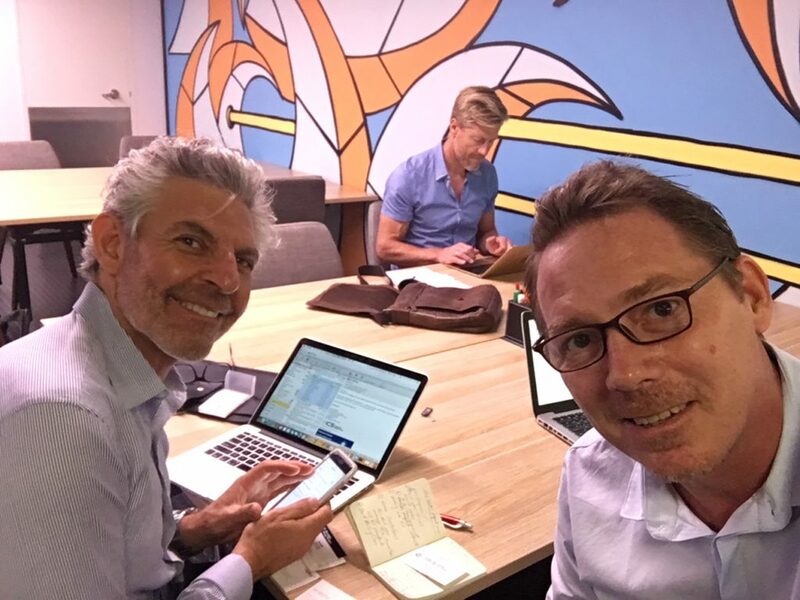 February 6 – Preparations is vital in order to reach our goal to increase our activities down under. Mark Hanna, Tore Moe and Paal Mathisen. Presentation to TNB Janamanjung Sdn Bhd Malaysia. March 22 – Perak, MALAYSIA. Left photo: Shortly after presentation of FS’s product and service, Steven Chong and Datuk Shamsul Ahmad, Managing Director of TNB Janamanjung Sdn Bhd (4th from left) pose for a group photo. Right photo: Steven Chong together with Mohd Syawal, Maintenance Manager, discussing how FS can help to fire protect the electrical cables. Busy week at Fire Security Middle East. March 10 – UNSTOPPABLE guys – After a busy week they celebrated with a 77km bike ride. 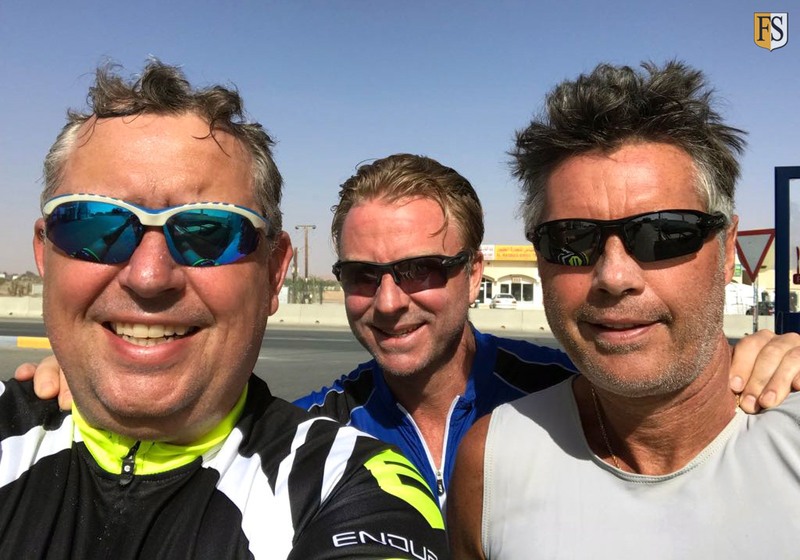 FS Middle East manager Jesper Rexen, Stefan Cudby -owner of Target Visibility and Ole Tom Eidjord – FS chairman. Cable survey at industrial plant in Manilla. March 28 – MANILA. March 2018 is the fire prevention month awareness and there is a growing focus on safety due to many fire incidents in industrial plants. After our survey at the cement plant we had a nice meal. From left: FS local partner Ms. Aida M. Padilla, Operations Manager, Ms. Cora De Jesus, Sales Manager, Mr. Almer Fulgar, Electrical engineer from Alco-Link. and Steven Chong, Project Supervisor at Fire Security Asia-Pacific. Cable life survey offshore Western Australia. 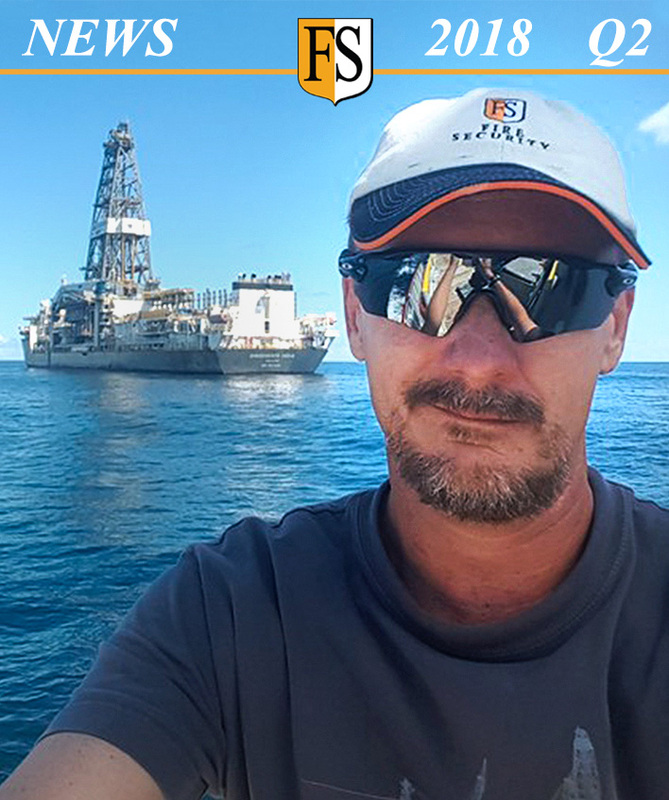 March 13 – Offshore Western AUSTRALIA: Paal Mathisen has just conducted a cable life extension survey of Vermilion Energy’s Wandoo B platform offshore Karratha, Western Australia. 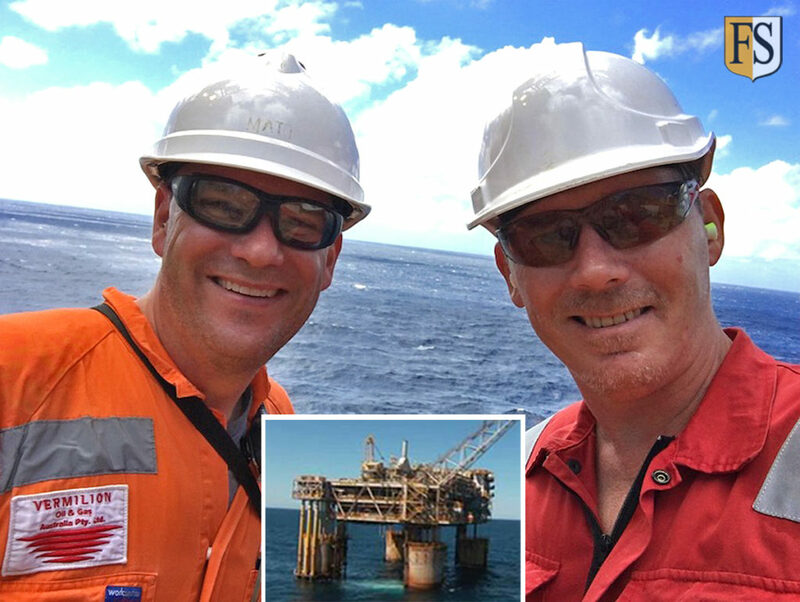 Thanks to Matt Stichnoth for his involvement and coming with me offshore. Survey of Hakuryu-11 Jack Up rig in Singapore. 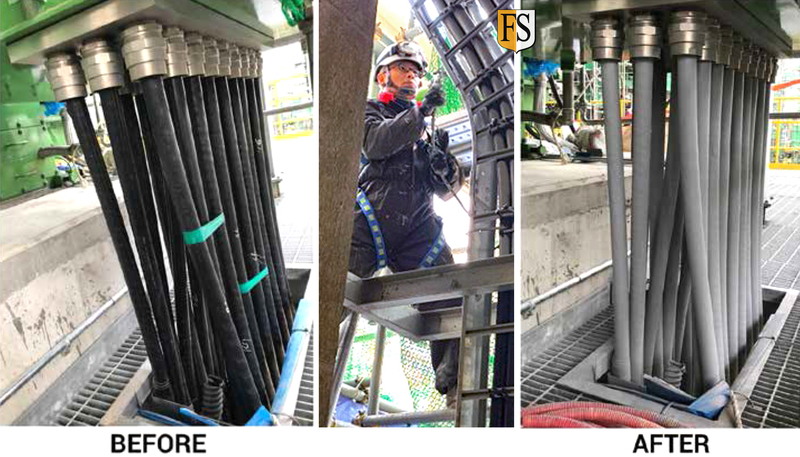 February 26 – Paal reporting from SINGAPORE: After successfully executed a cable repair and cable life extension job last year, Fire Security have been asked by Japan Drilling Company to survey two more rigs. I have just done the survey of Hakuryu-11 Jack Up rig in Singapore. Cable survey for Japan Drilling in Vietnam. March 30 – Mission Completed. 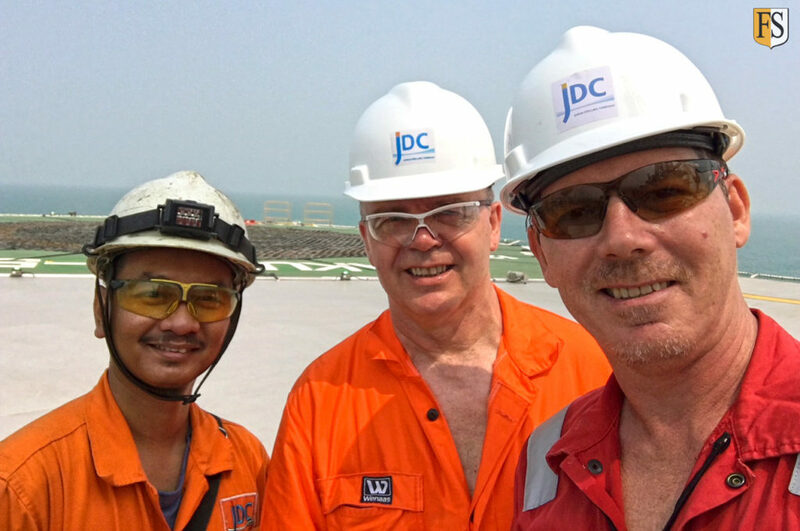 Cable survey completed on JDC’s semi submersible rig Hakuryu-5, here we are together with chief electrician Iwandoyo (left). 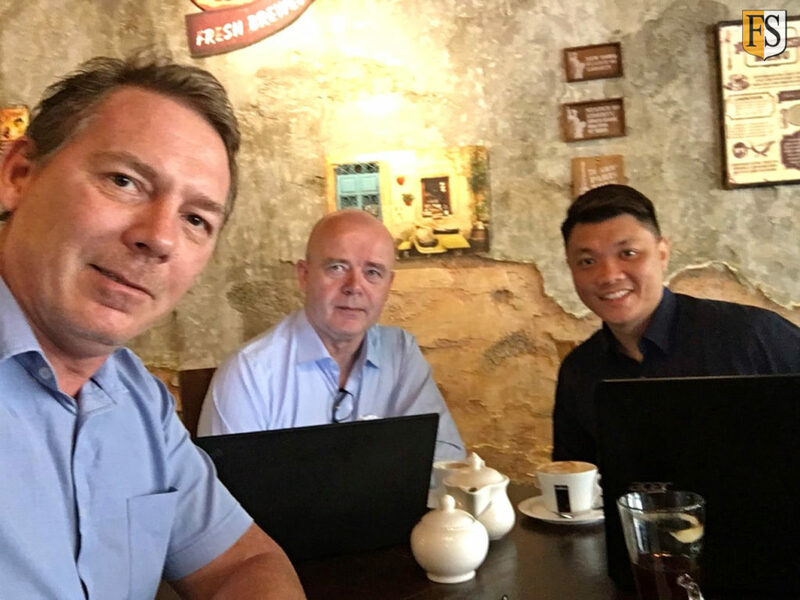 Meeting Petrovietnam Drilling in Ho Chi Minh City. March 30 – Good Morning Vietnam. Back in Ho Chi Minh City. 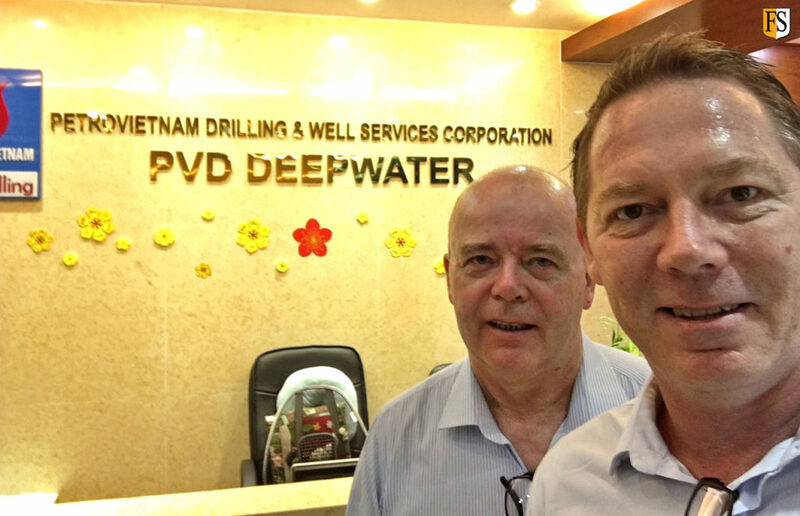 After the offshore survey in Vung Tau we had an early morning meeting with Petrovietnam Drilling. Cables are important and that makes FS important, so we were instantly asked to survey two of their assets, one Jackup Rig and one Semi-submersible Rig. Looks like i am coming back here soon..
Wolrd’s biggest cruise ship Symphony of the Seas has cable fire protection by Fire Security. March 9 – BIGGEST EVER cruise ship. 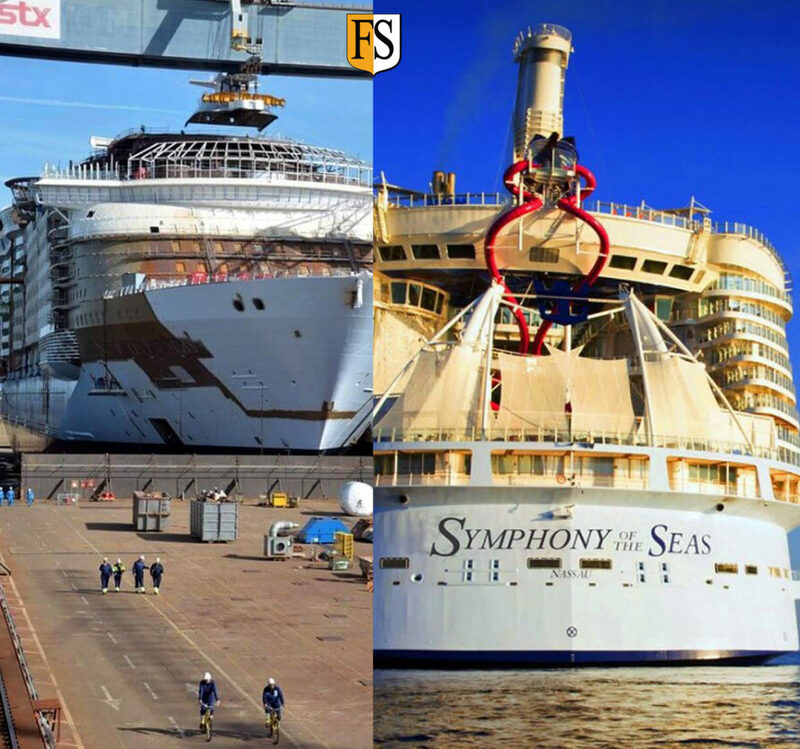 Mr. Marek Bober and his FS crew has completed cable fire protection onboard Symphony of the Seas. This is the world’s newest and largest cruise ship, weighing 230 000 tons, and more than 5 of these tons are Fire Security coatings that has been applied in high risk areas all over this magnificent ship at STX Shipyard in St. Nazare France. Cable fire protection project for Carnival Cruise Lines. 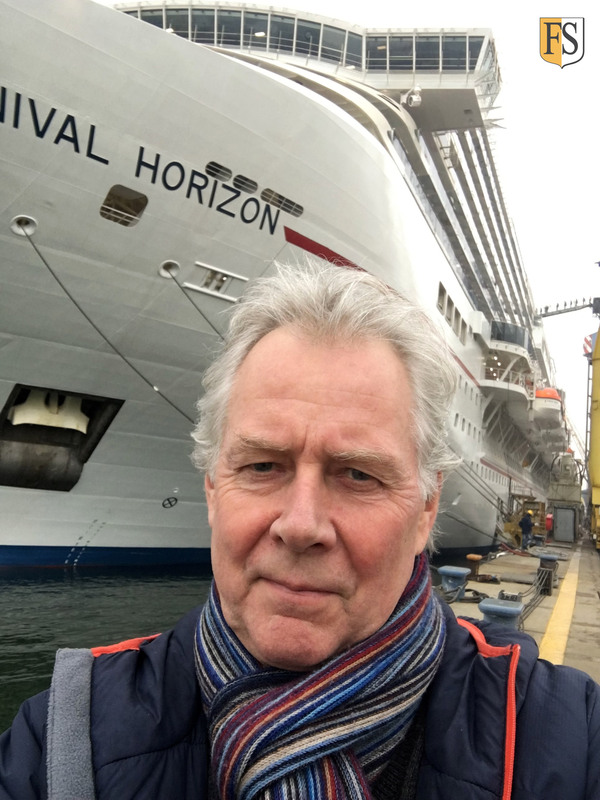 February 1 – Terje Waage in ITALY: Our next fire protection project starting 2 weeks from now is “Carnival Horizon” being build at Fincantieri shipyard in Venice. Horizon is the fleet’s 26th and largest vessel – together with the sister-ship Carnival Vista (2016). Horizon is Carnival’s “the most family-friendly ship”. Cable fire protection for Ponant Cruises. 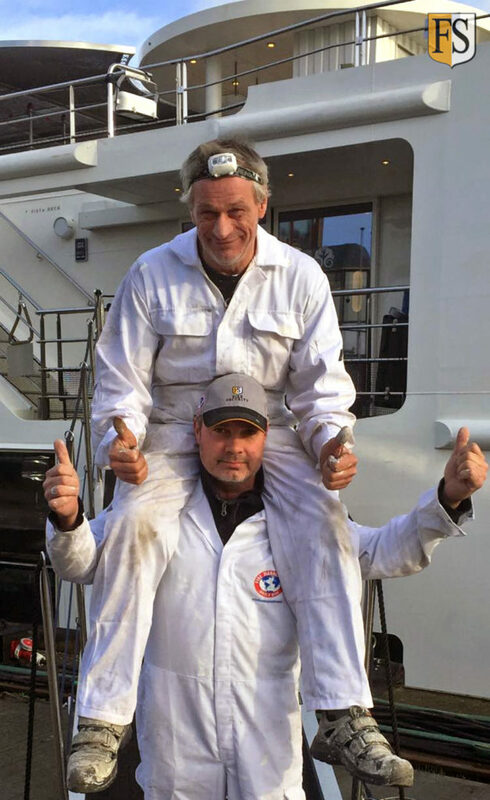 March 21 – Johnny Ryen, Piotr Bober and Zbigniew Bober are working onboard the Le Soleal for Ponant cruises. They started the project in Uruguay and will complete when they arrive in Brazil later this week. Ponant sails under the French flag and is based for upper class customers, who are searching for the extra luxury on there vacation cruise. Cable fire protection for Crystal River Cruises. 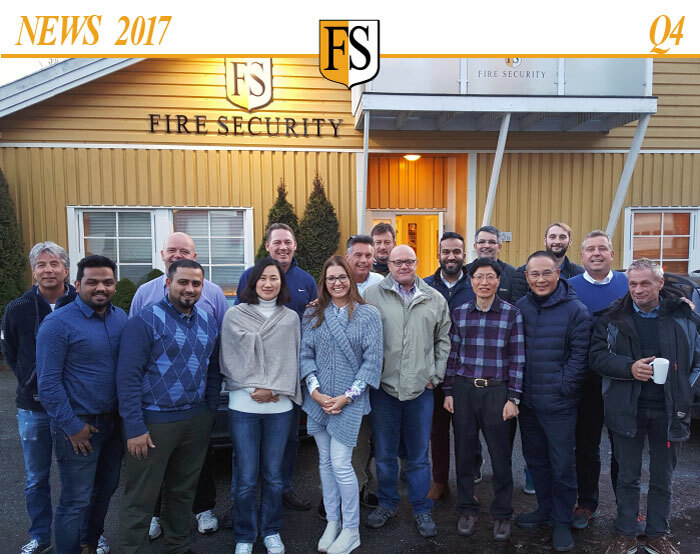 January 19 – Fire Security’s highly skilled crew Johnny Ryen and Hans Olsen is in Grave, Netherlands. They are carrying out a project for Crystal River Cruises. Later this week they will travel to Linz in Austria to fire protect another vessel for the same company.